It’s time for a new Memory Keeping Monday! And have teamed up once again with Bee Tree Studios and The Paper Vine. What is Memory Keeping Monday? It is a way to share pages we have been working on or motivation to complete a page. It really is about supporting each other so we complete our albums and preserve our memories. All layouts are welcome – project life, digital, traditional scrapbook pages, and blog posts! If you don’t have a blog you can link to a page in a gallery or even to a Pinterest post. And it DOES NOT have to be a Disney page!! This link up will be open until February 28 at 7:00 pm EST. 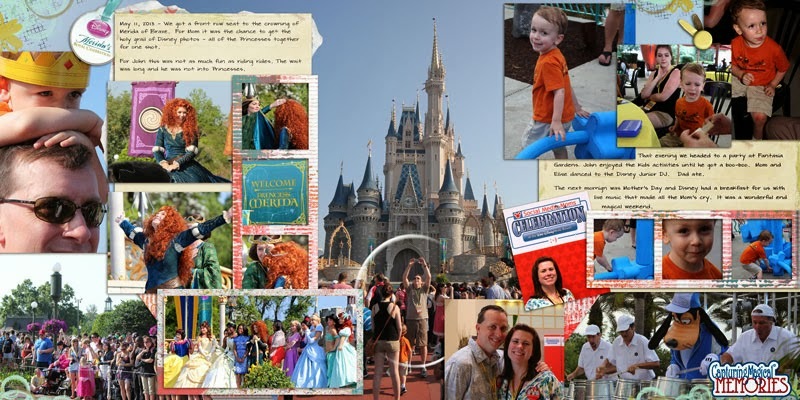 Last time I shared the beginning of my Disney Social Media Moms Celebration at Walt Disney World. Today, I finish up my trip with this two page spread. I used very little paper at all and just let the photos speak for themselves. On Saturday morning we got attend the Merida Royal Celebration in front of the castle. As you can see Little Man did not like the waiting at all. In But we had fantastic shots. They had us right in front of the stage and there was even a space between us and the press. Then behind the press was general public. In the two page spread you can see the castle photo where I took a photo of my husband taking a photo of the crowd. He was amazed at how many people came out and stood in the sun for this. That evening Disney held a TRY IT dinner party for us at Fantasia Gardens. They had Radio Disney there with some organized events for the kids to get them active. Little Man jumped in and the only thing that stopped him was a boo boo. The funniest thing (thank goodness there are no photos) was my niece and I learning to dance to a One Direction song. It was not pretty and I learned I am sooooo far beyond cool. The next morning they held a Mother’s Day breakfast for us and the best part was having a group of singers perform their favorite Disney songs about Moms. My eyes teared up at Baby Mine from Dumbo and You’ll Be In My Heart from Tarzan. That is it for my Disney Social Media Moms Celebration recap. Next time I will get back to some boring family trip photos. Here is a button you can add to your linked posts or sidebar if you feel so inclined, it will link back here to the Memory Keeping Monday link-up posts! I love the line “dad ate.” lol! Love Disney, I like how you capture your special moments! beetreestudios It was funny. I was writing it up and that really is all he did that night. Other than apply a band aid. KathleenKL Yeah!! We are having ours on Saturday. It is a low key party but I love seeing what everyone else is doing. Are you going low key or all out!! I love these pages. The princess page is great. The shots you got of Merida are wonderful. Terrific photos! Glad you had a great time, I cherish my WDW memories. Love what you did, the collage! The pictures are amazing! We’re going to WDW in March, I can’t wait! Great Photos! I haven’t done any scrapbooking in ages!